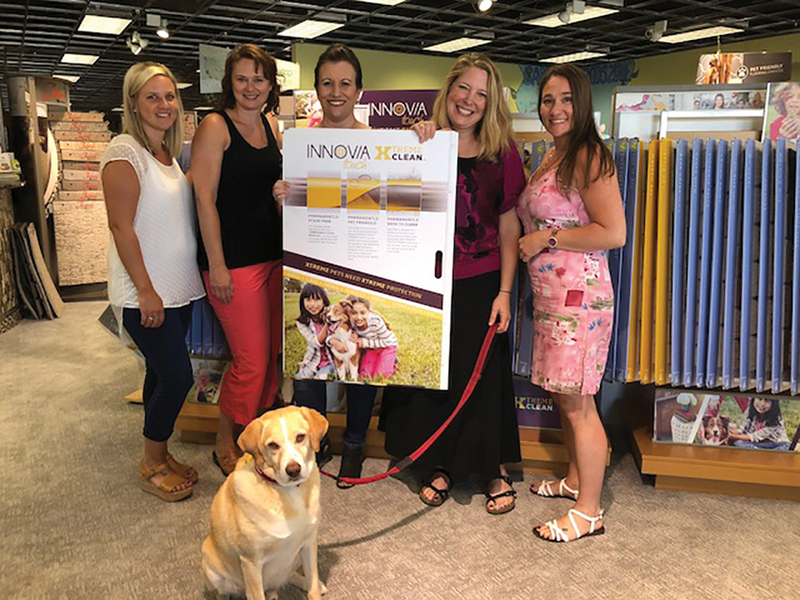 Ponderay Design Center staff (from left to right): Alicia Holt, Michelle Fournier, Sarah Lunde, Tiffany Baldwin and Drake. • one of our councilmen brings his dog here frequently. Paws up and a big bark out to The Ponderay Design Center Campus that includes Sandpoint Furniture, Selkirk Glass and Cabinet, Sandpoint Carpet One and the Clearance Center, located at 401 Bonner Mall Way in Ponderay. 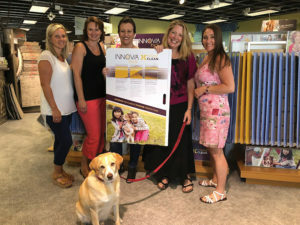 I met interior designer Nikki Luttmann at Carpet One when we were sniffing out new flooring for our abode. She graduated from Cal State Long Beach with a degree in design and textiles. Livin’ on the LA freeways wasn’t her kind of having fun, so she relocated here in 2002, and has been with the Design Center for eight years. Here you can find specific items for each member of the family, as individual comfort is a priority. The Mister and Missus were in search of a Drake-friendly floor — something that did not show my magical fibers. This request was no problem for Nikki. She shared with us that once upon a time she made a mistake of having a black lab with white carpet in her home, which turned out to be like a designer dalmatian! Guess who was in need of a pet-friendly vacuum? We matched samples of dog-friendly flooring to my color palette. How fun was that! Nikki helped us form our ideas into reality. Next came the Drake-friendly area rugs to match. They are warm, cozy and comfortable to lie on when the weather gets chilly. We got to take a few home samples for a test run. Trust me: Big-name flooring and furniture companies are all represented in our neck of the woods, and the mark up is not as much as in the big city. Nikki will also help you with paint, as she collaborates with the paint stores in town. This is such a one-stop shop local family place! Need a scrap of carpet for a cat tree? Vinyl for a chicken coop? Piece of rug for a dog house? Custom cut runners for your entry? Just ask Nikki: She’s got all kinds of ideas to turn your dreams into reality, as this place has been family and dog friendly for years. Original owners, Dale Jefferes, Mike Gunter and Dwight Sheffler have passed the baton to the next generation of owners, their children. Jamie Becker, a flooring department specialist, brings her shelter dog Sierra to work. And there is a shop service dog at Selkirk Glass and Cabinets. Once you’ve decided on your floor covering, check out the line of pawsibily offered by the best pet- and kid-friendly, cost-effective cleaning products of Better Life. There are no toxins in these bad boys. They are naturally derived and pH balanced, which makes them gentle on your skin and ideal for cleaning any surface or fabric. Sundays are meant for family, and the Center is closed. Mark your calendars now for their only Sunday soiree. This family Sunday Holiday early in December will be a festive one, complete with cookies, treats, cider, give aways, balloons and costumes. And did I mention it’s a paws up barkin’ good sale? You’ll experience pawsitive customer service every day. No matter if your project is residential, new construction, large or small, this pack is here to make your design dreams a reality. Furniture, mattresses, flooring, glass, cabinets, counter tops and a clearance center — everything for your house can be found on this campus. •All well-behaved two- and four-footed family members are welcome. •No lifting a leg on the carpet, floor, furniture, etc. A King Charles spaniel who felt right at home has already tested it. Check out their social media presence on Houzz, Facebook and Pinterest.